I am very keen on this clever slip stitch method of making a honeycomb pattern. 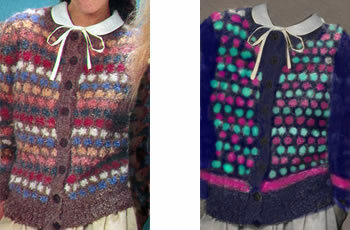 This cardigan is from the 1980s knitted in a bouclé chunky yarn. I thought it makes a good option if (as I do) you love a design in the latest Rowan magazine (56), but want something quicker and easier to knit. I have mocked up a colour scheme to show what it might look like, using 2 contrast spots instead of 6, making the sleeves plain and adding coloured bands; you could also make bracelet length sleeves (also a favourite of mine) but maybe less appropriate in a chunky weight cardigan. One benefit of the design as it stands is that you could potentially use up left over yarn in the contrast spots - you could even have every set of spotted rows a different colour for a fun design. The pattern is given in 3 sizes; the smallest size first and the 2nd and third sizes in brackets. Where only one number is given it applies to all 3 sizes. With Main (M) wool and No 8 (4mm) needles cast on 56 stitches. Work in k1/p1 rib for 7 cm, 2¾ ins, finishing with a right-side row. 1st row: with 1st contrast, sl1, * k3, sl1, repeat from * to end. 2nd row: with 1st contrast, sl1, * p3. sl1, repeat from * to end. 3rd row: with 1st contrast, sl1, * k3, sl1, repeat from * to end. 4th row: with 1st contrast, sl1, * p3. sl1, repeat from * to end. 5th row: with M, knit. 6th row: with M, purl. 7th row: with 2nd contrast, k2, * sl1, k3, repeat from * , ending last repeat with k2. 8th row: with 2nd contrast, p2, * sl1, p3, repeat from * , ending last repeat with k2. 9th row: with 2nd contrast, k2, * sl1, k3, repeat from * , ending last repeat with k2. 10th row: with 2nd contrast, p2, * sl1, p3, repeat from * , ending last repeat with k2. 13th to 16th rows - with 3rd contrast work as 1st to 4th rows. 19th to 22nd rows - with 4th contrast work as 7th to 10th rows. 25th to 28th rows - with 5th contrast work as 1st to 4th rows. 31st to 34th rows - with 6th contrast work as 7th to 10th rows. These 36 rows form the pattern, and are repeated throughout. Note: you can carry yarns not in use loosely up the side of the work to avoid too many joins. Continue until work measures 37 cm, 14½ inches, from beginning, finishing with a wrong-side row. Keeping pattern correct, cast off 4 stitches at the beginning of the next 2 rows. Then, decrease one stitch at the beginning of every row until 53 (57, 61) stitches remain. Continue without further shaping until work measures 58 (59, 60) cm, 23 (23¼, 23½) inches, finishing with a wrong-side row. Cast off 5 (5, 6) stitches at the beginning of the next 4 rows and 4 (6, 5) stitches at the beginning of the following 2 rows. Slip remaining 25 (25, 27) stitches on to a stitch-holder. rib for 7 cm, 2¾ ins, beginning alternate rows with p1, and finishing with a right-side row. Change to No 4 (6 mm) needles. With M, knit one row and purl one row. Continue in pattern as for back and work straight until front is same length as back to armhole, finishing at side edge, with same patt row. Continue without further shaping until work measures 54cm, 21¼ inches, finishing at front edge. Cast off 3 (4, 4) stitches at the beginning of the next row. Then, decrease one stitch at the same edge on every row until 14 (16, 17) stitches remain. Continue without further shaping until work is same length as back to shoulder, finishing at armhole edge. Work as for left front, reversing shaping. With 4mm needles and M, cast on 32 stitches. Change to 6mm needles. With M, knit one row and purl one row. Then beginning with the 1st pattern row, continue in main pattern as for the back, still increasing on every 8th row until there are 53 stitches, working new stitches into the pattern as soon as possible. Continue without further shaping until work measures 45cm, 17½ inches, finishing with the same pattern row as on the back at armhole shaping. Cast off 4 stitches at the beginning of the next 2 rows. Then, decrease one stitch at the beginning of the next 8 (6, 6) rows. Then, decrease one stitch at each end of every 4th row until 21 stitches remain. Join shoulder, side and sleeve seams. Work in k1 /p1 rib for 9 rows, beginning alternate rows with p1. With 4 mm needles and M, cast on 7 stitches. Work in rib as for neckband until band is long enough, when slightly stretched, to fit up left front. Cast off in rib. Work as for buttonband, making buttonholes to match marked positions by casting off 3 centre stitches in one row and casting on 3 stitches in next row. Set in sleeves, gathering top edge slightly to fit into armholes. Sew on front bands. Press seams lightly. 7 (7, 8) 50g balls in main colour. and 2 50g balls in each of 6 Contrasts. One pair each No 8 (4mm) and No 4 (6mm) knitting needles. pattern. using 6 mm needles. cm, 23 (23¼, 23½) inches. Sleeve seam, 45cm 17½ inches. Sirdar Romano is a chunky bouclé yarn knitting to a tension of 14-16 sts to 4 inches over stocking stitch - which is an average chunky weight. Check the yarn you substitute as chunky covers a fairly wide range of numbers, and adjust your needle size by knitting a swatch. I have no information on yardage but from memory it was a light weight yarn thus may have had a good yardage - so you may need more than stated if using a different yarn.